Oh dear! NumiQueen is sick! The beloved NumiQueen started to have problems the other day. One minute it was fine, and then the next minute the display faded and then only one digit came on, and dimly. I feared the worst, especially as I have become attached to the large bright display of the IV-13s. I turned the NumiQueen off and on. Many years of using Windows taught me that turning off and on solves most problems, but it didn't solve this one. I turned it off and left it off for an hour, to let any hot components cool off. That also didn't help much. The display would run correctly for a few seconds and then dim out again. Clearly this was a sick clock. Jürgen from Nixiekits is in the middle of moving at the moment, and he's not online much to ask questions of, so this is a problem that will have to be solved by yours truly. After doing some investigation, the problem appears to be with the power supply. Looking at the output with a scope, the smoothing is not at all smooth. Sniffing the case of the external power supply confirms the suspicion. The electrolytic capacitors for the output smoothing have indeed vented. One of them has a vaulted dome on top of it, and the other seems to have just splurged gunk over the board. Extracting the capacitors makes the case totally clear. The power supply is only a couple of months old, but both of the capacitors have failed in the same way. One has bulged the top and the other has vented from the base. Normally this should only happen from older, or over-stressed components. Or... Ones that are crap. I have never heard of the manufacturer "CTC", but it seems significant that both of these capacitors failed in the same way at the same time and after only a few weeks of service. Possibly a bad batch of components. Possibly a bad manufaturer. But the point remains: If you have a NumiQueen and you have problems with the power supply, it could well be this the cause. Fixing it was easy: Solder in two new electrolytic capacitors of the same value, but with a lower coefficient of crapness, and we are on the road again, Now it just remains to be seen if there is a further problem in the design of the supply, or if it really was just some sub-standard components. That's the lasting impression when working with this clock. It's not very cheap, but there seems to be no corner cut, or compromise made. It's worth every penny you paid, and you'll end up thinking it's probably worth more than you paid. 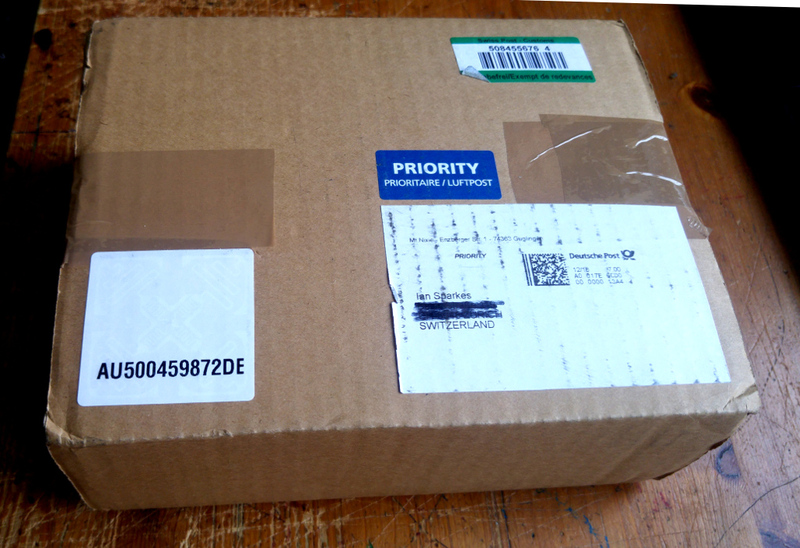 From the moment of receiving the box (you have to sign for it, it is sent via tracked post), the impression is good. "That's a big box" for a clock kit, but when you open it up, all the surprise of receiving such a big box dissolves. The box is big because it contains lots, and it's beautifully packed, well padded and full of electronic and retro goodies. One thing to note is that the IV-13 Numitron tubes are not included in the kit I received, and you'll have to shop around for them. A power supply is provided, with the appropriate plug for the county the package is sent to. That's a nice touch, and shows that care and attention has gone into every aspect of the clock presentation. The power supply is not some cheap no name brand. It's heavy, chunky and clearly a quality unit, with certifications on the rear side. The difference between this supply and some other supplies is that the certifications are real. The impression of quality remains when you open up the box. There is a case included in the kit, and it looks nicely made, and includes all of the hardware needed, right down to the rubber feet. All the ICs are provided with sockets, as well as ceramic sockets for the tubes. 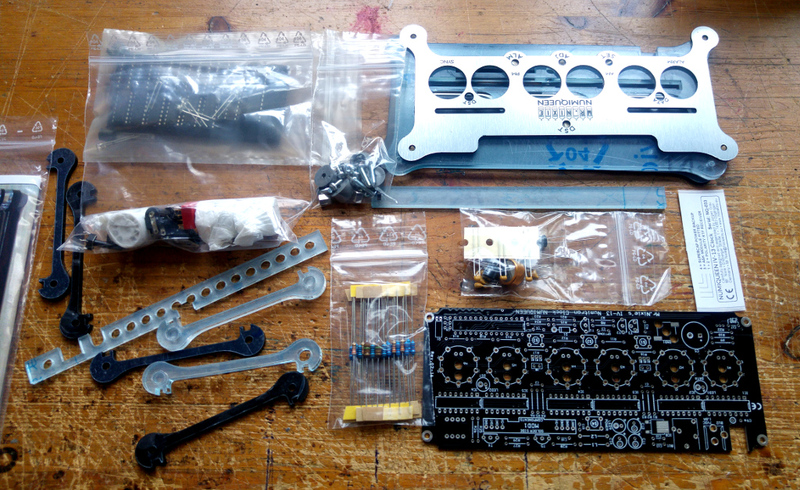 The number of components is not particularly high, and while the instructions say that this is a kit build for the experienced electronics enthusiast, the level of skill needed does not seem all that high. Nearly all of the components are "through hole" (which means they are easier to handle and mount for the average hobbyist, because they don't need special tools. There are two large format surface mount devices, but neither these are a problem to mount without special tools. Tweezers help, but are by no means an absolute necessity. The instruction manual is available online and this is an area that could do with a little more explanation for clock constructors without much experience. To be fair, Jürgen does aim this kit at people with a fair level of experience, but addition of a few more words in the manual would lower the experience bar a good deal. The assembly instructions are correct, but a little short in places. If you have plenty of experience, you will sail through the assembly, but if you are quite new to constructing clocks, you might find it a little confusing or vague in places. If you can read the schematic, you'll be just fine.